Harper feels as if she will be consumed by the guilt she feels after her sister, June, kills herself. June was the smart sister, the pretty one who always had everyone’s best interest at heart. No amount of rationalization can make Harper understand why June would kill herself and not leave any explanation or note. Harper feels horribly alone. After her mother and father divorced each other and June’s suicide, Harper is numb. With her best friend Laney’s support and the willingness of June’s friend Jake, Harper sets out to make June’s dream of seeing California a reality. Harrington created Harper as a character who grows and matures as a reader turns pages. Initially juvenile, Harper becomes an adult as she learns through music and friendship. Harper felt that June had abandoned her and that no one understood what she was experiencing. During June’s funeral, Harper left her mother to deal with everything and was not helpful. Reading Harper’s progression from immature girl, blaming everyone around her to a wise adult is heartwarming. Laney is Harper’s only true friend. Striving to help and support Harper in every way, Laney is admirable despite her tendencies to party. Laney is struggling with a crisis of her own at the time of June’s suicide, but still comes on Harper’s mission and always listens when Harper needs to talk. June’s friend Jake had a rough childhood and is devoted to music. He believes music can improve anything and help anyone. Jake volunteers his van for Harper’s mission and seems like one of the few people Harper can open up to. 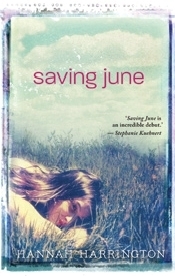 By saving June, the three teens gain redemption. This book is a five on a five star scale. Hannah Harrington was able to create a character and then bring her to maturity in the space of about 320 pages. The author’s skill with writing is clearly recognized in her work. A reader will enjoy reading about Harper, Laney, and Jake. Because of June’s death and other mature content, this book should be enjoyed by high school aged readers. Both my blogmate and I read this book and we absolutely loved it as well. Great review! Thank you! I loved the main character. Love this review. Definitely checking this book out!